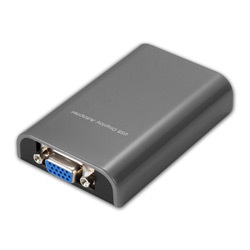 This USB Display Adapter enables you to connect one more monitor, LCD or projector to a computer with a USB 2.0 port. For desktop users adding an extra monitor via USB connection is easier than ever without having to open the computer chassis to install an internal video card. Once the installation is done, the USB-attached monitor soon wakes up. No function key hassle to swap a second monitor. With this handy adapter, you can enjoy many benefits brought by an add-on monitor. The most obvious one is that you get more desktop area to have more applications visible at one time. 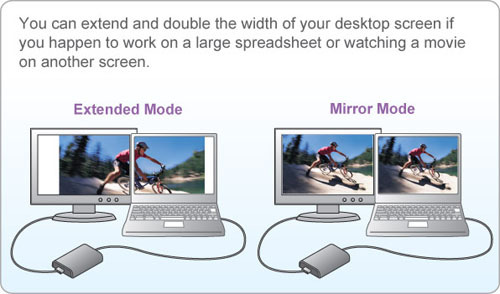 For example, you may work on one monitor while your family watching video on the other. No more stacking windows within the confines of a single display. System performance is an important issue when using multiple monitors. Another benefit of this adapter is that it uses little computer resource; ensuring users get quality display without comprising computer performance. Small in size, works with all VGA or DVI-I displays. Extend and Mirror mode support.